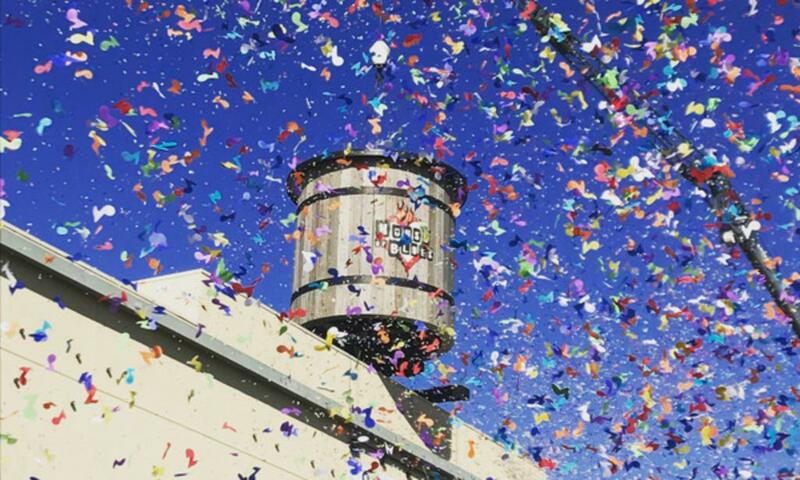 The trademark House of Blues water tower being lowered as a celebratory blast of thousands of music note-shaped confetti shoots into the air. Known for its intimate setting, homey Southern food, signature folk art, and rockin&apos; musical atmosphere, the House of Blues had been a staple in Downtown Disney for 15 years before closing up shop in May. Thankfully, the loss was temporary and in March, House of Blues will be rocking Orange County once again in its new Anaheim Gardenwalk location. The Anaheim locale is the first House of Blues to be built in the US in a decade and at 44,000 square feet will be the biggest and best yet. "With House of Blues Entertainment celebrating its milestone 25-year anniversary, the new House of Blues Anaheim will be the flagship venue for our storied group of music halls. 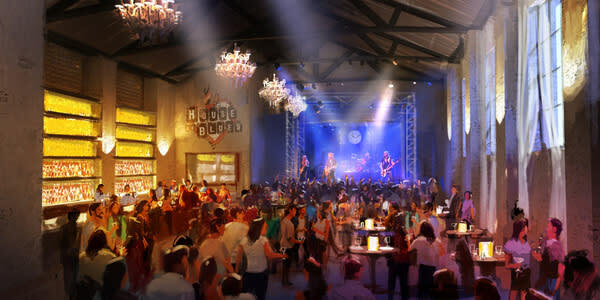 This new venue marks the debut of what we believe will be the most beautiful music hall and dining experience in the country," said Ron Bension, president of House of Blues Entertainment. The Atrium leading to the main stage features several bars and towering murals by artists such as local Johnny "KMNDZ" Rodriguez. Rodriguez is well known in LA&apos;s Pop Surrealist art scene and the "KMNDZ" moniker alludes to the "undo" option on a MAC, serving as a reminder that we can rectify the past by focusing on the future. Beyond the Atrium, concert goers will find the main concert hall which has a 2,200 person capacity and includes 14 VIP boxes. OC natives Social Distortion will be performing the opening concert to a sold-out crowd on February 28. Korn, George Thorogood, Daya, Billy Idol, Wu-Tang Clan, Common, Save Ferris, and Reel Big Fish are just some of the other artists schedule to perform in March. Also inside the new House of Blues is The Parish room is a 400-person venue ideal for up-and-coming artists. Past up-and-comers who have graced the intimate stages at House Of Blue include Mackelmore and Mumford and Sons. Of course, the other part of the House of Blues experience is the food. 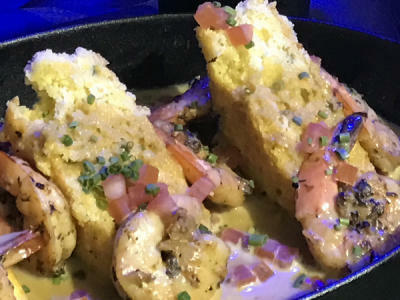 Lunch and dinner served daily with signature menu items such the saucy, smoky Smokehouse St. Louis Ribs, the Fried Chicken Sliders with their distinctive buttermilk tang, and the spicy Voodoo Shrimp served up over a slice of sweet, jalapeno cheese cornbread. Dessert options include the Bourbon Bread Pudding which is baked with white chocolate and bananas and finished with a bourbon caramel sauce. At the bar handcrafted cocktails are unique and inspired. The electric blue Kentucky Bubble Bath features Makers Mark bourbon, fresh lemon juice, elderflower liqueur, blue curacao and a bubble topping. El Viejo is a manly cocktail made with Pisco Porton, creme de cacao, toasted pecan bitters, and garnished with cigar smoke. Entertainment is served up alongside the tasty food and drinks every day of the week, including open mic nights on Tuesday and Wednesday and the world famous Gospel Brunch on Sunday. For more information visit the House of Blues Anaheim website.